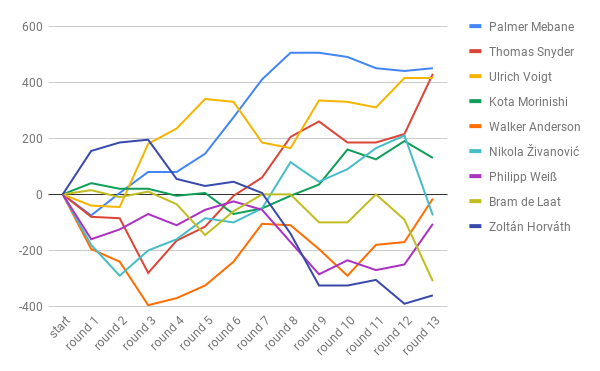 While analyzing the WPC result for my review series (starting with WPC 2018 review, part 1), I made a couple of pretty graphs, which I’d like to share here. 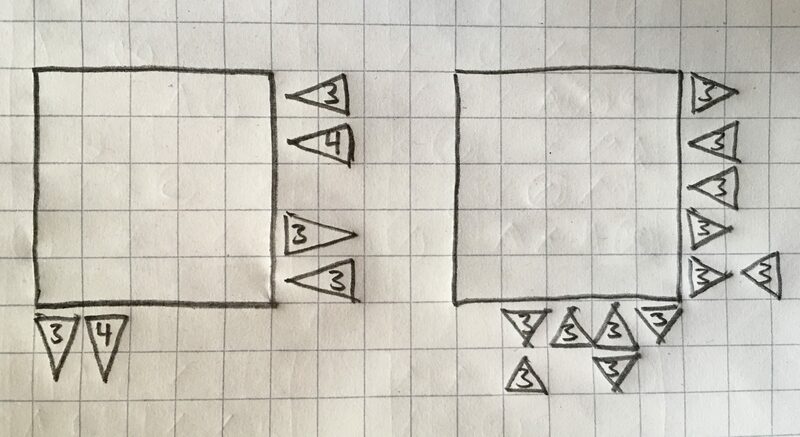 To make these, I scraped the result PDF into a spreadsheet; I hope it’s useful to you. 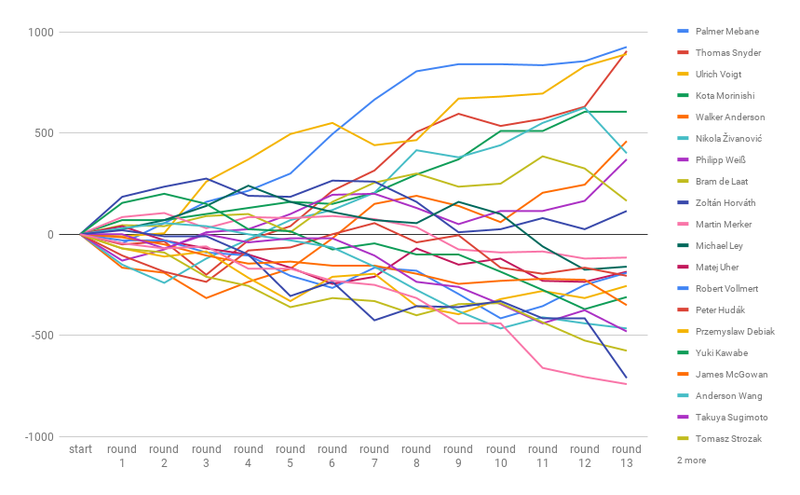 To start with, a visualization of my scores per round, relative to the 10th best score. This is what I based my analysis on. A very flat Thursday, peak for the Paths round, Friday afternoon dip and then a strong finish. 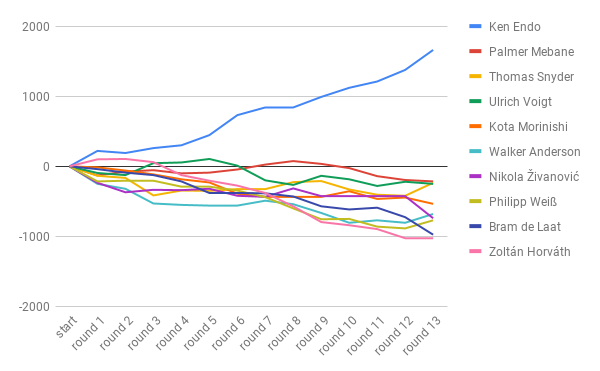 Next a couple of graphs of how the positions developed over the course of the tournament. 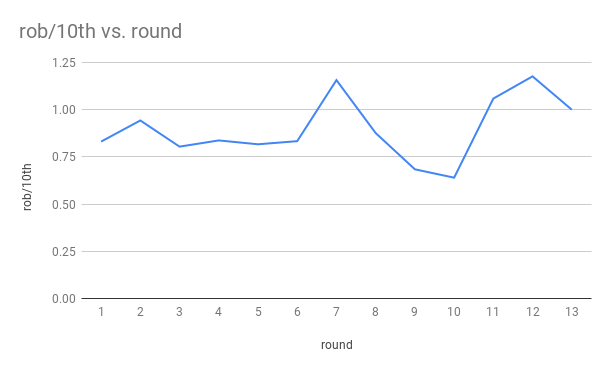 As a base-line for each of these, I chose the sum of n-th best scores per round, for a suitable n. First you can see just how much stronger Ken Endo is than anyone else, then that things were more exciting behind him than the first graph shows. And finally a top 20+ graph. I’d love to see what else you can get out of the data! This entry was posted in Puzzles and tagged report, wpc on 2018-11-19 by rob. This entry was posted in Puzzles and tagged report, wpc on 2018-11-16 by rob. 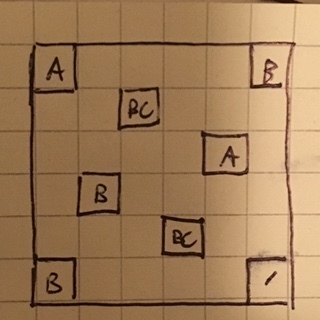 Rules Fill the grid with numbers 1 to 5 so that they don’t repeat in rows or columns. 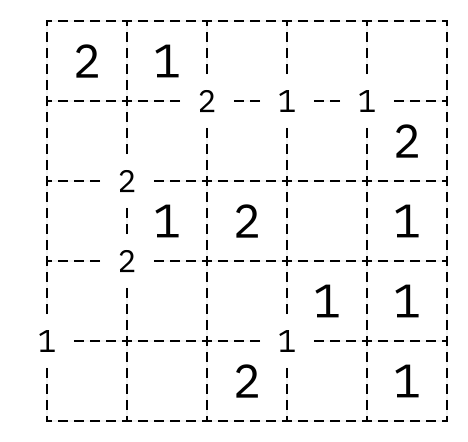 The hints around the grid denote all the increasing or decreasing sequences longer than 2 in the given row/column in the correct order. The sequence is increasing from the tip of the sign. This entry was posted in Puzzles and tagged stalagtites and stalagmites on 2018-11-16 by rob.